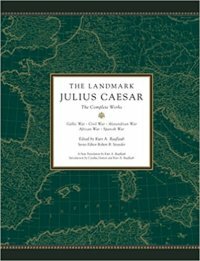 As part of The Landmark Series, The Landmark Julius Caesar is another brilliant presentation of primary sources combined with a collection of maps, pictures, and notes to make ancient works navigable to new readers. The accounts in this edition – the Gallic War, the Civil War, the Alexandrian War, the African War, and the Spanish War – is a new translation by Kurt A. Raaflaub which makes Caesar’s work accessible without sacrificing scholarship. Nearly 800 pages, The Landmark Julius Caesar will stand as a lasting testament of scholarship for academics, students, and the educated public. The Gallic Wars is Caesar’s account of the battles and intrigues that took place in the nine years he fought the Germanic and Celtic people in Gaul. The writing is described as direct and simple, with its limited vocabulary making it a popular school text. Because of his victory in Gaul, Caesar had increased the alarm and hostility of his aristocratic enemies who were planning to prosecute him when he returned to Rome. To defend himself, Caesar wrote the Gallic Wars as an effort to communicate with the plebeians to propagandize his activities as part to increase the glory and influence of Rome as well as to protect himself against his enemies. In the Civil War, Caesar covers the first years of the military campaign against Pompey when he defeats Pompey’s generals in Italy and Spain. Afterwards, Caesar returns to Rome to be elected as consul and then defeats Pompey himself in Thessaly. In his account, the civil war is a personal disagreement and therefore he emphasizes clemency towards his defeated Roman citizens and his attempts to negotiate directly with Pompey. These acts, Caesar tells us, along with his defeat of Pompey’s army, had the support the Roman people against a small senatorial faction who were against him. The Civil War appears to be unfinished, never providing the resolution of Pompey’s death and instead directs us to the Alexandrian War which describes Caesar’s involvement in the Egyptian civil war between four royal siblings over their decreased father’s kingdom. Caesar eventually delivers the throne to twenty-one ear old Cleopatra. In the African War and Spanish War, Caesar’s final campaign against the remaining Pompeians is recounted. Like the Alexandrian War, these two books were written by an anonymous author and idolizes Caesar but also depicts the massacres that his army committed. By this time in 45 BC, Caesar reigned supreme and was in the second year of his ten-year dictatorship to rule Rome. Not surprisingly, there is nothing in these accounts to suggest Caesar wanted to overthrow the republic and establish a monarchy. In political life, Caesar restored Roman economy with a policy of rent control, debt relief, and public works, and appointed a new political class to fill the gap left by the death of many during the civil war. But in 44 he was made dictator for life; had his head depicted on a coin minted in Rome (being the first living person to do so); and accepted divine honors in a republic of supposedly equal citizens. Later, when the Senate approached him, he had refused to rise. He was assassinated by a group of senators on the Ides of March, which sparked another civil war until Augustus became the first emperor of Rome in 27 BC. Chronicling the military campaigns of Julius Caesar, The Landmark Julius Caesar presents a picture of the military and political developments that led to the collapse of Roman republic and the birth of the Roman Empire. Hardly to be read as objective history, Caesar’s account should be interpreted as both political propaganda and pedagogical in teaching the public the value of heroism against their enemies north of the Alps. It is this skill, perhaps above all others, Caesar’s ability to transform his portrayals of his self-interest into models of martial valor, that makes his account even greater and more lasting than his actual military campaigns.